Today, I want to talk about how to take care of your soldiers. This is an important topic that many military leaders don’t really understand. I hear so many officers and NCOs talking about “taking care of Soldiers” that it almost makes me laugh. Unfortunately, some of these leaders are confused about what this statement really means. Some military leaders think it’s their job to be “friends” with their followers. They think being “liked” is part of their job description. They think that taking care of their soldiers is about making things easy for their soldiers. In my opinion, “taking care of Soldiers” means preparing your Soldiers for combat. It means they are highly motivated, disciplined, and trained to do their wartime mission. It consists of five different elements. Your number one priority as a military leader is to ensure your Soldiers are mentally and physically prepared for combat. Nothing else is anywhere near as important as this task. This means that your soldiers are trained to do their individual tasks and collective tasks, have the proper mindset (warrior ethos) and physical fitness to go-to-war, do their job and come home safely. If your soldiers aren’t prepared for combat, you’ve failed as a leader. That’s how I see it. If your soldiers aren’t trained properly, some of your soldiers might die in combat because of YOUR leadership ineffectiveness. Personally, I don’t think I could live with myself if I knew some of my soldiers died, because they weren’t trained properly. I don’t want that to happen to you either. Therefore, you must constantly assess why you are doing what you are doing. You must provide tough, realistic training that challenges your Soldiers and develops their skills. You must train like you fight. All training must be battle-focused. Additionally, you must ensure your entire unit or section is capable of functioning as an organization, too. Although risk management is important, you still need to train like you fight. Make sure you plan and execute, tough realistic training at all times. Your soldiers deserve it! The Army standard is the only standard. As an Army leader, it’s your job to enforce standards with everyone under your supervision. When you see a soldier do something wrong, you have the responsibility to enforce the standard and correct the problem IMMEDIATELY. It’s up to you HOW you do it, but you better do it. I’ve found it’s much easier if you hold everyone accountable to the same standard: the Army standard. If you give one person a break, you’ve failed as a leader. For instance, if your policy is to FLAG people who fail the APFT, you better FLAG everyone who fails the APFT. Don’t give your First Sergeant, Platoon Leaders, yourself or anyone else a break. That’s not fair or proper! The minute you do that you lose your credibility. Holding soldiers accountable to the standard actually improves unit morale. After all, soldiers understand the Army standards. They enjoy discipline. They expect it. They want to know that if they do things right they will be rewarded and if they do things wrong they will be punished and held accountable. After all, what type of unit would you rather serve in: a unit that enforces the Army standard or one that doesn’t? I know which unit I would choose: the disciplined unit that enforces the standards. Lead from the front and always enforce the Army standards equally, to everyone in your unit. Failure to do so will devastate morale and decrease combat effectiveness. This is one area that many leaders fail at. When you see Soldiers do something right, you should give them an “atta boy” once in a while. This could be a unit coin, achievement medal, pat on the back, promotion, free lunch, thank you card or anything else you deem pertinent. If your Soldiers only hear from you when they do something wrong, you are not doing your job effectively. You need to let them know when they are doing a good job, too. There’s nothing worse than doing a good job, but feeling like no one gives a damn. Make sure you spend as much time rewarding good behavior as you do punishing bad behavior. I tell everyone to “watch” for Soldiers doing the right thing. If you can do that you will be surprised at what you will find. Make it a point every day to “find” five soldiers doing the right thing. Pull them aside and give them an atta boy. They will appreciate it. This goes hand-in-hand with tip number three. When Soldiers fail to meet the Army standards, it’s your job to hold them accountable. You have the responsibility to punish poor performance. If you don’t punish poor behavior, it will negatively impact your unit’s morale, readiness and combat effectiveness. Good Soldiers don’t like seeing the bad Soldiers “get over.” Trust me on that one. There are plenty of different ways to fix poor performance. Several examples include UCMJ, reductions in rank, Article 15’s, poor evaluations, formal reprimands, negative counselings, bar to reenlistment, recouping bonuses, etc. Your key to success is to make sure that Soldiers clearly understand what is expected of them and know what will happen if they fail to meet those expectations. Punishment should never be a surprise. That’s where formal counseling comes in to play. Please note, I’m not telling you that you need to crucify someone when they mess up. Everyone will mess up from time to time. Just make sure the punishment you administer matches the crime. Be firm, fair and consistent with how you punish poor performance and behavior. And, be sure you are following the same standards you are trying to enforce. As a leader, you should provide frequent feedback to your direct reports and to your soldiers. The best thing about it is that it’s really easy to do. Whenever you see something done well (or poorly) pull the person aside and give them immediate feedback. Make sure your Soldiers know where they stand with you at ALL times. Don’t make them wonder what the boss is thinking. You can do this verbally and via written counseling. At the end of every day, or after every training event, spend a few minutes with each person you supervise and give them feedback. Talk about what went right, what went wrong, and how things could be improved. Your followers will appreciate this. Everyone deserves to know where they stand with their boss. Don’t you agree? In conclusion, these are my best tips on how to take care of your soldiers. Taking care of Soldiers means that you ensure they are capable of performing their war-time mission as individuals and as a unit. It means they are mentally tough and physically fit. It means they have the skill and will to do their job. In order to do that successfully, simply the follow the five steps outlined above. What are your thoughts? What do you think taking care of Soldiers means? Leave a comment below to share your thoughts. I look forward to hearing from you. Awesome points on how to prepare your soldiers for battle. You have to prepare them for any kind of physical as well as mental stress. And leadership coordination are the main factors in the soldier training. Yes, taking care of Soldiers means making sure they can do their job and warrior tasks. These 5 points are a good starting point for leadership. First, your men must be ready, willing and able to to the mission: Fight and win. If your unit cannot perform their wartime duty, then you have failed. Standards should not be flexible, but I have often seen them treated that way. In the reserves I've seen the full time staff (AGR) slither out of thinks like fitness tests or mandatory formations. All this does is sow resentment between the traditional Guard/Reservists and drive a wedge between them. 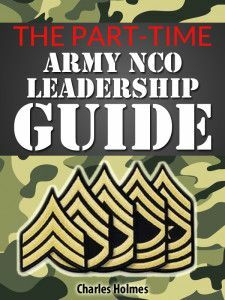 Everyone is subject to the same standards even if that person is the 1st Sergeant, the Commander, your troop or yourself. I agree that you have to enforce the standards to everyone under your authority. You also have to ensure your Soldiers are mentally and physically fit. You make an excellent point about people confuse leading and taking care of someone with being liked. Good leadership is a lot like good parenting: people want to feel safe, protected, sure of the rules and the consequences. They want someone who acts the part. People are much more likely to like you if they respect you, but not necessarily the other way around. Taking care of your Soldiers means that you lead by example, you help them develop, you teach them to set goals, you hold them accountable, you reward them when they do good, you punish them when they do bad, etc. Most people confuse taking care of their soldiers with being liked. The two have no correlation. The advice here about providing consistent feedback is really important. If someone is doing a bad job and never hears about it, it is hard for them to improve. Communication is so important and really helps everyone succeed in their job. Keep your team accountable, reward good performance and punish those who don’t. That’s pretty much the formula for success. Good points, Leslie. Feedback is definitely important. If you never tell your troops where they stand, they won’t perform at a high level. Communication is paramount, just like you mentioned.